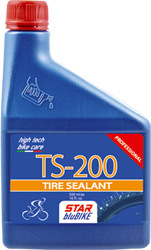 Bicycle Tire Sealant TS200 instantly seals tubeless and notubeless up to 5 mm. puntures. Shake the bottle and add sealant through valve stem with removable core or dismount and pour directly into the tire. TS200 remains liquid for 2-5 months. Use one bottle of 60 Ml. for every tire. Active up to -15 C.
cod. 20018 TIRE SEALANT 60 ml. cod. 20041 TIRE SEALANT 120 ml. cod. 20022 TIRE SEALANT 500 ml.